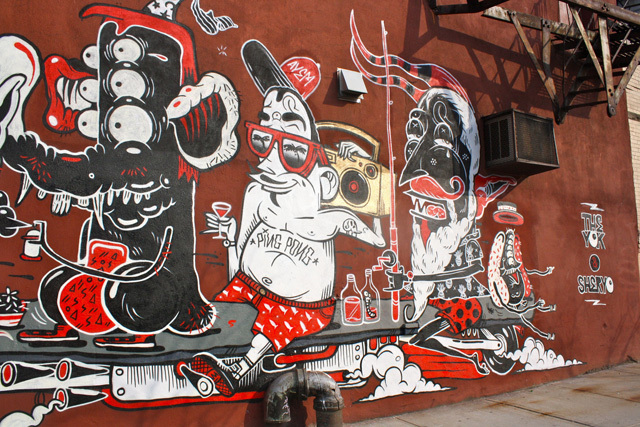 The Bushwick Collective. Photo by Mr Seb. 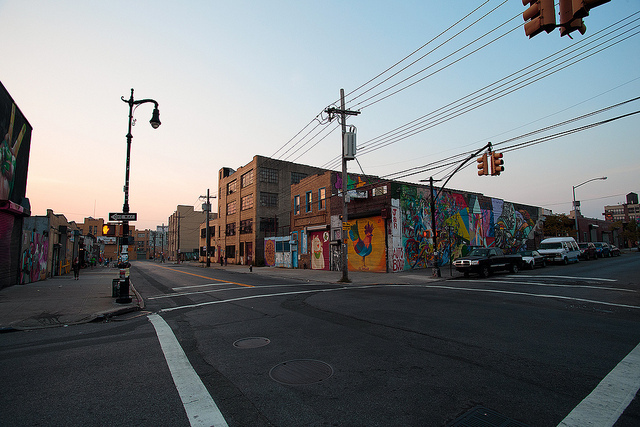 What do Bushwick, Chicago, and Detroit all have in common? Their mural cultures are under threat. 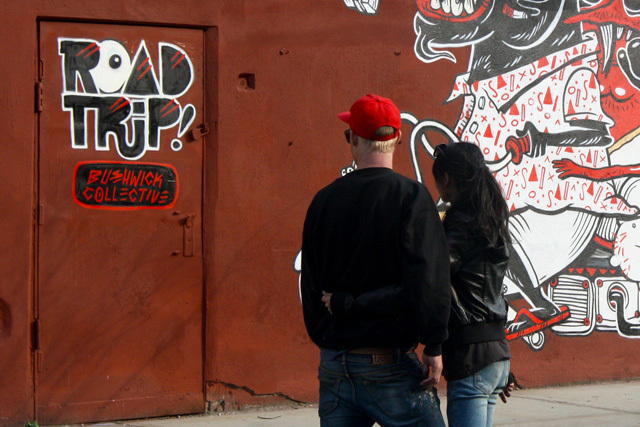 In Bushwick, gentrification and greed some to be putting the final nails in the coffin of The Bushwick Collective. 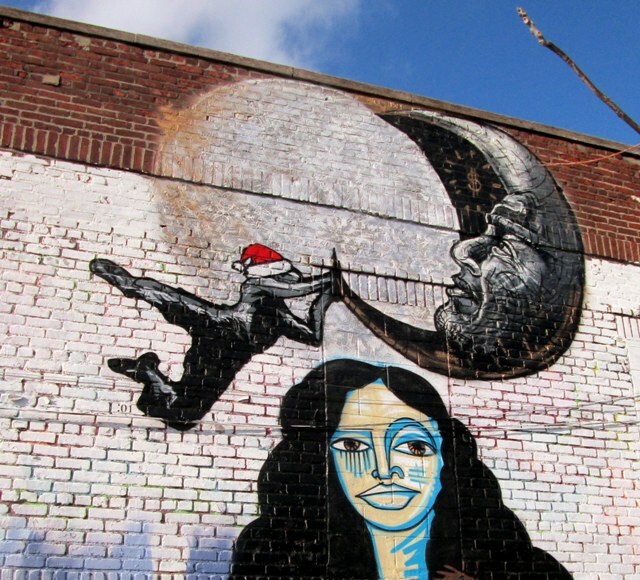 In Chicago, the city is failing to pay artists and organizers for murals that they commissioned. 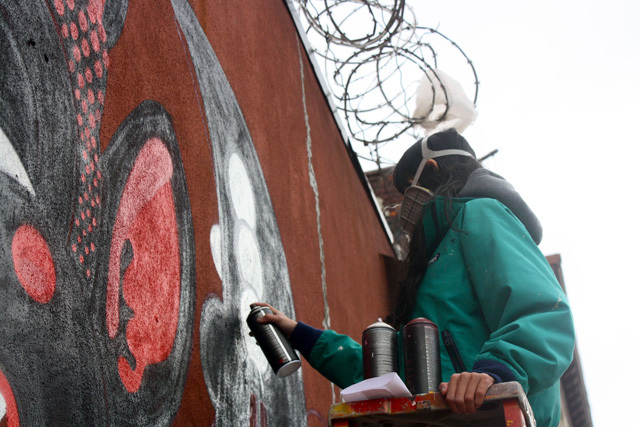 In Detroit, city officials are trying to tame graffiti’s Wild West with regulations that are bound to cause problems. 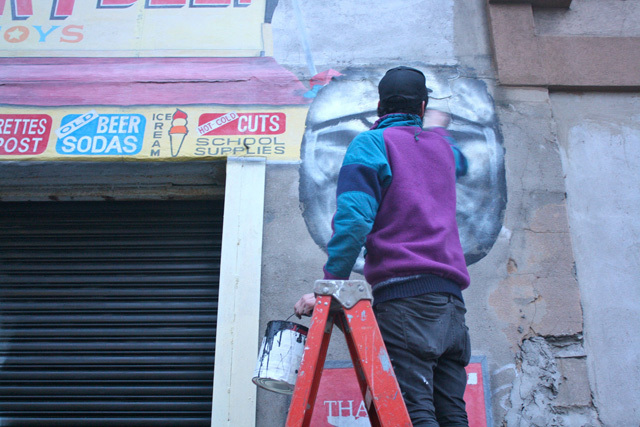 The Bushwick Collective’s year hasn’t started out so well. 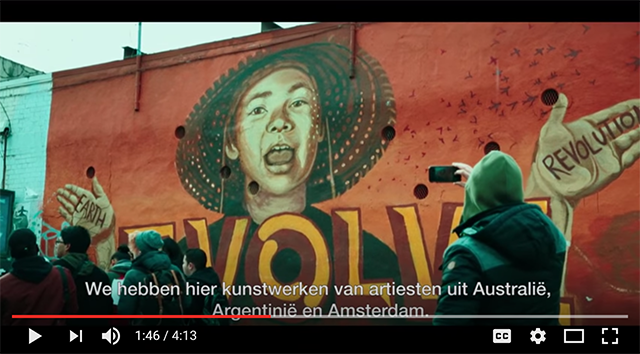 There was always suspicion among artists and art fans about the project’s motives. 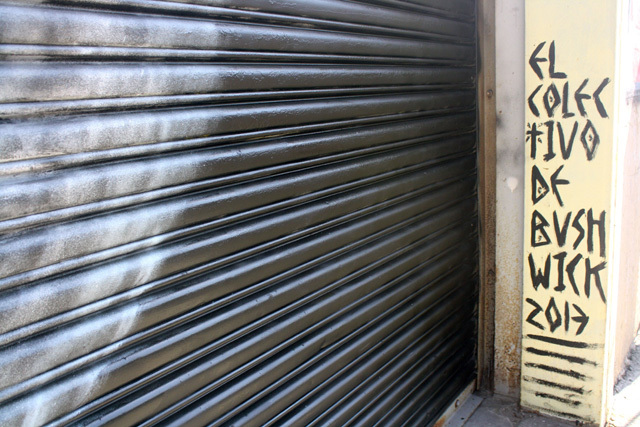 Behind closed doors (and sometimes publicly), you’d hear suggestions that The Bushwick Collective was an exploitative gentrification effort rather than a celebration of art, and its no secret that the project is anti-graffiti and doesn’t usually allow political messages in murals. 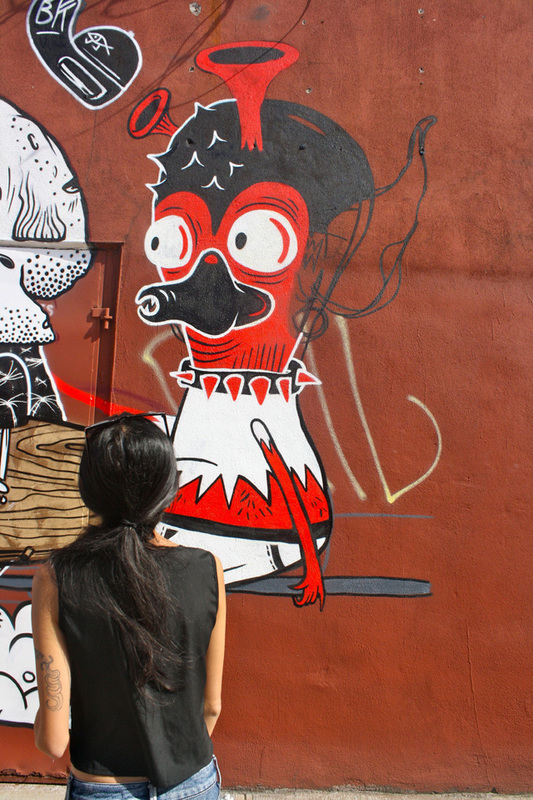 But they have walls, so plenty of artists set aside their reservations and paint there anyway. 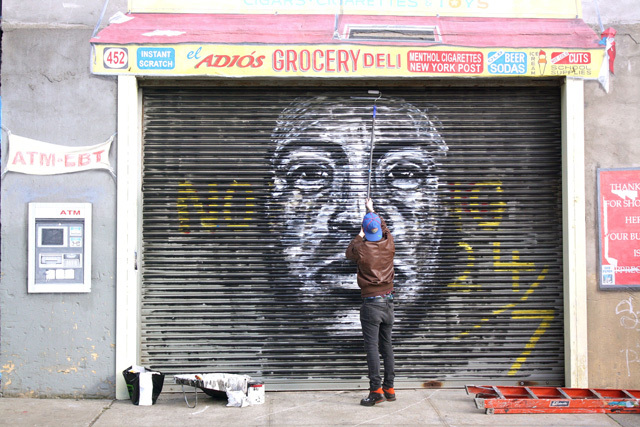 Now, those rumbling frustrations about gentrification and whitewashing of graffiti have gone explosively public, with ZEXOR dissing over a dozen Bushwick Collective murals with his tags and throw ups. But are ZEXOR’s accusations based in fact? 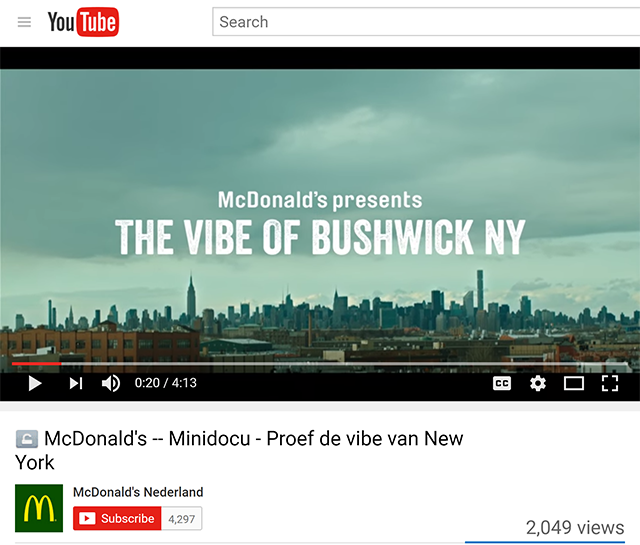 The latest development at The Bushwick Collective suggests so. This month, what appear to be frames for two billboards were installed on top of Bushwick Collective murals. The (currently empty) billboard frames were installed with complete disregard for the murals they partially cover by Concrete Jungle, The Yok, and Sheryo. So much for subtly transforming the neighborhood in the name of art. Seem to me though that with these billboard installations, The Bushwick Collective is finally showing their true colors. I’ve reached out to The Bushwick Collective on Sunday for comment, as well as for more information about the billboard frames and the building owner’s relationship with the Collective. As of Tuesday night, I have not heard back. 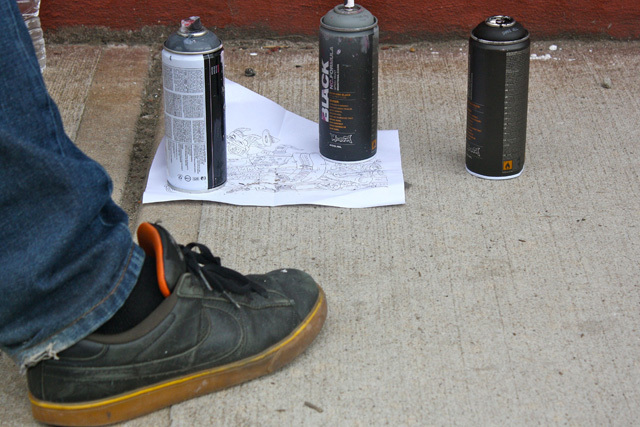 Roa in Chicago, a mural organized by Pawn Works. Photo by Kevin Tao. 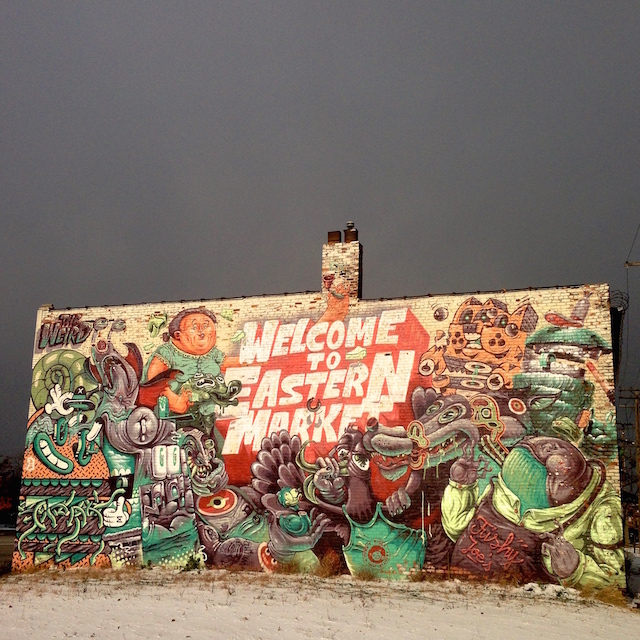 A mural in Detroit by The Weird. Or is it graffiti? Photo by RJ Rushmore. 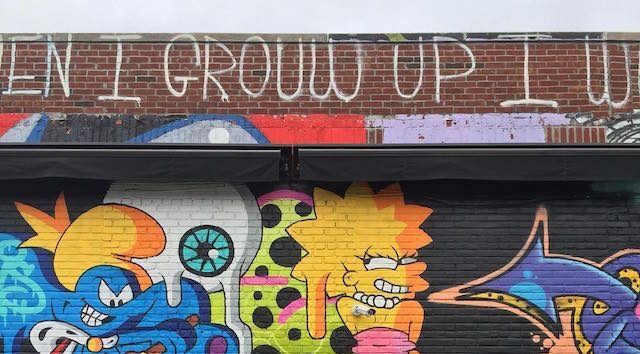 Finally, politicians in Detroit are trying to change the city’s reputation as the Wild West of graffiti. 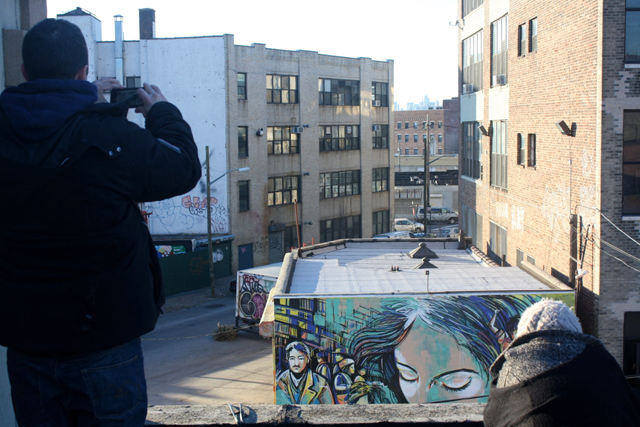 A city council member is working on new anti-graffiti regulations that would fine property owners for not cleaning the graffiti on their buildings. It’s unclear how new regulations will be different from the tickets that the city is already issuing, but presumably they would make it even easier for a Detroit building owner to be ticketed for graffiti. 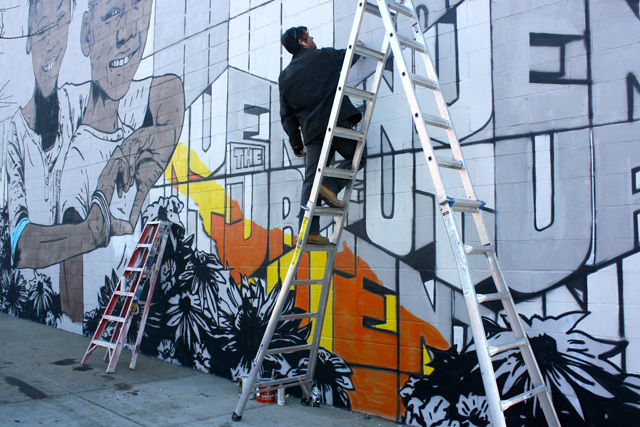 As the Metro Times asks, how do you determine what’s graffiti and what’s a mural? That’s a determination that the city is already messing up, and the proposed solution of a database of all the legal murals in the city is bound to be incomplete and difficult to maintain. Regulations like these make me nervous, not just for the graffiti and for property owners, but for all public art in Detroit. 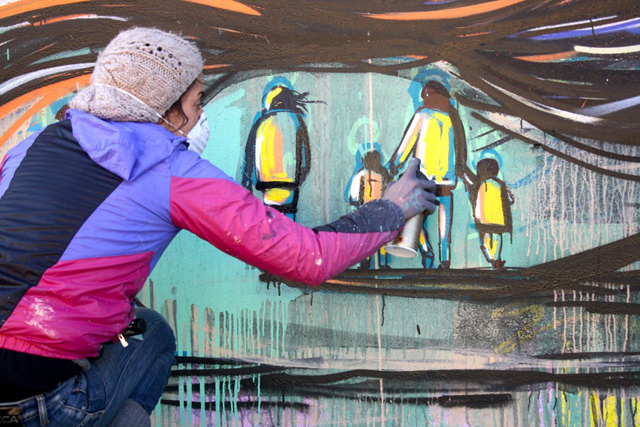 Imagine you’re a property owner in Detroit and an artist comes to you about painting a mural on your property. Even if legally that’s okay and you’d love some art on your wall, do you really want to take the risk that there will be confusion and you’ll be fined and investigated by the city? These regulations could have a serious chilling effect on the muralism Renaissance taking place in the city right now. Detroit can’t seem to properly manage the system they’ve already got to ticket property owners for graffiti. Why give that system more power? More intense regulations like the ones being developed now will only serve to hurt Detroit’s property owners, artists, and public art. 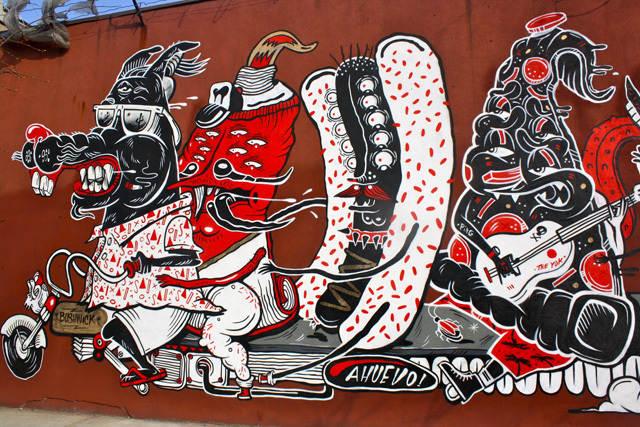 In recent years, a lot of great art has come out of The Bushwick Collective, and Pawn Works, and the overall mural culture in Detroit. Maybe, hopefully, I’m just being a Chicken Little about all this news. After all, there are other murals in Bushwick and Chicago, and the Detroit regulations are a long way from being implemented, but let’s not pretend that everything is all okay. 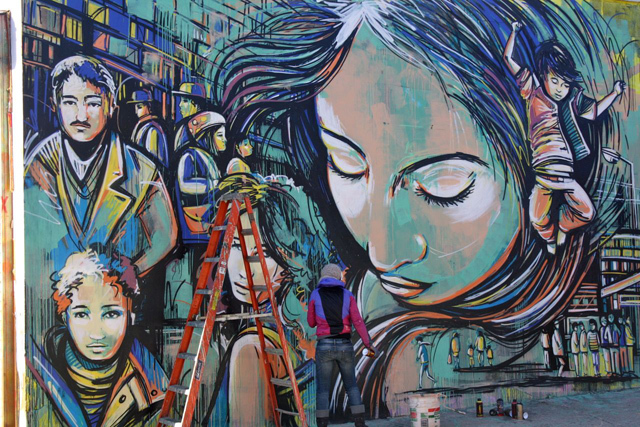 These amazing mural cultures, often held up as some of the best in the nation, are under threat from greed and mismanagement. 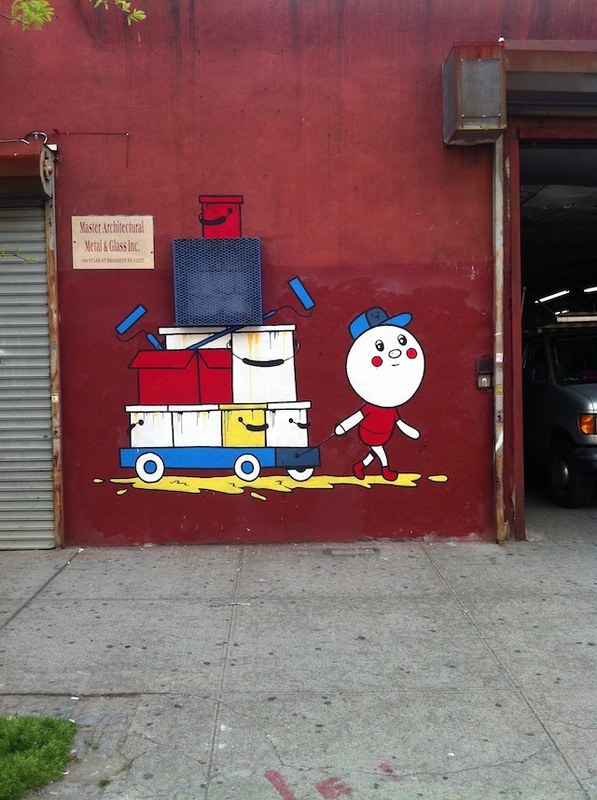 Sonni recently painted this piece in Brooklyn on a Bushwick Collective wall. 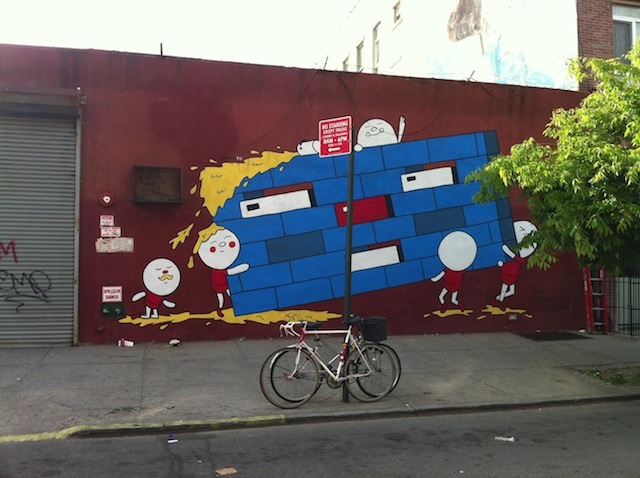 As you can see in the photo above, it’s right by Gaia’s recent piece for The Bushwick Collective. 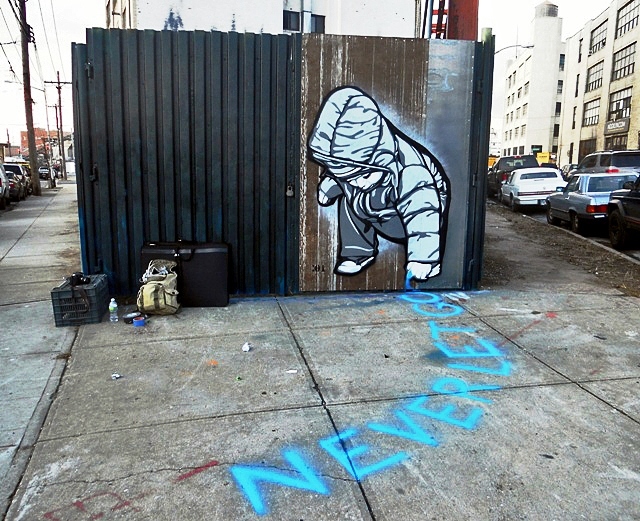 I’m so glad to see that Sonni is out painting in NYC. His work is so fun and it just makes me smile. 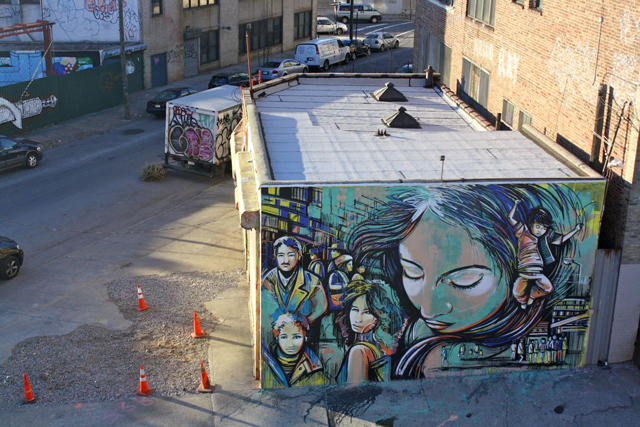 Note: This article is the third in a three part series that discusses how three artists dealt with the topic of histories within their Bushwick Collective murals. Check out part 1 here and part 2 here. 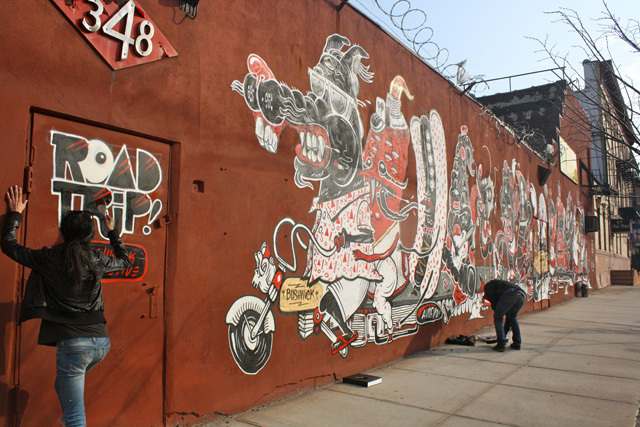 Recently, the Yok and Sheryo shared their “Pipe Dreams” with 5 Pointz in Long Island City. 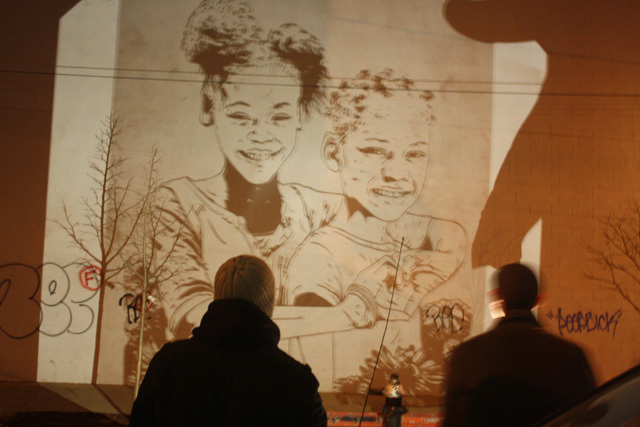 This past week, the duo chose to show the Bushwick Collective their present rather their future. 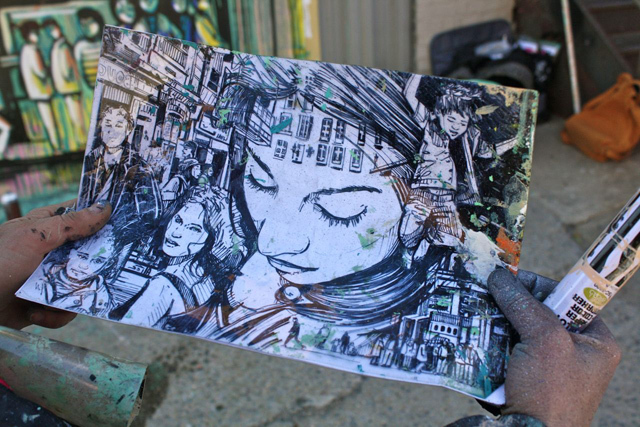 Emblazoned with the locals of Bushwick, such as roaches, rats, pizza, and the devil, their composition contains memories of their travels as well as these traces of home. 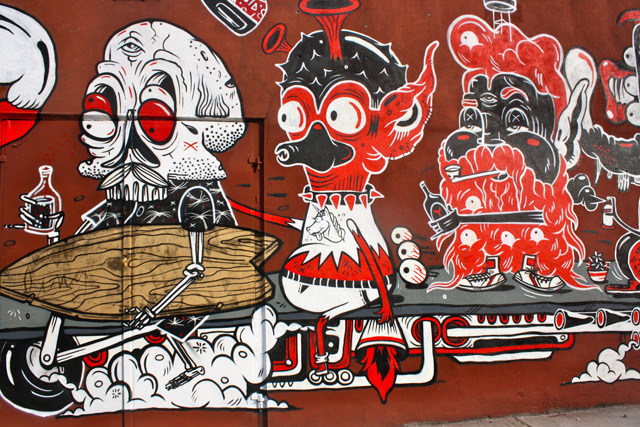 Titled “Road Trip,” skeletons can be seen surfing, which the Yok took in while in Australia, alongside various characters painting and drinking. Together, each of these cartoons rides an extended motorcycle, joining memories of home and far off excursions. 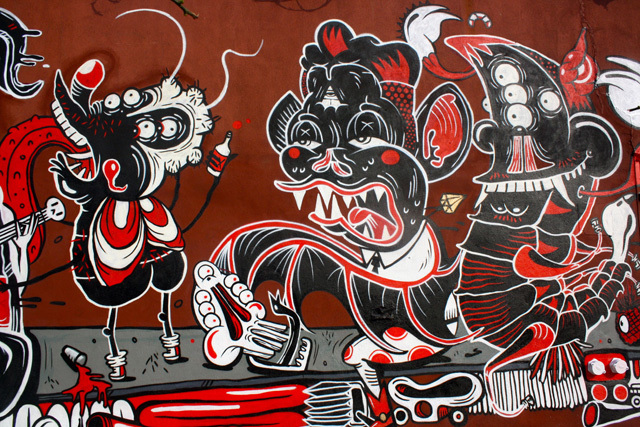 The complex narratives in their collaborative walls often contain coded jokes as well as the dominant narrative; Ping Pong nicknames references to cartoons find their way into the descriptive elements of each figure. Most endearing of any character Sheryo has created was one that surfaced recently in the crew of cyclists. An alien with other worldly features and was placed between a bearded man and a surfing skeleton in the central part of the piece. The artist said that it represented herself as an illegal alien, going so far as to create a unicorn on the being to match her own clothing that day. This self-portrait sees the artist riding alongside representations of her travels and local friends, enjoying the ride. 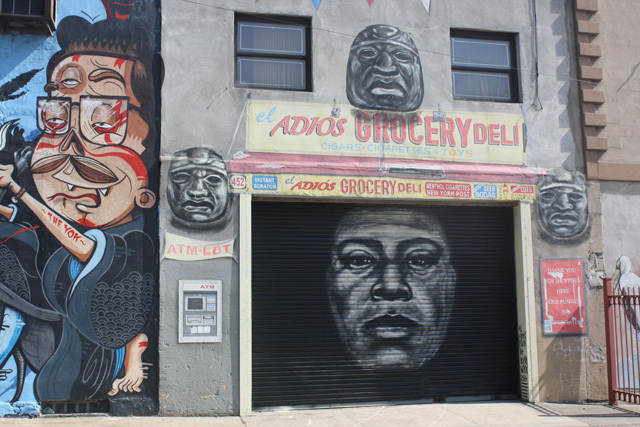 Note: This article is the second in a three part series that discusses how three artists dealt with the topic of histories within their Bushwick Collective murals. Check out part 1 here. 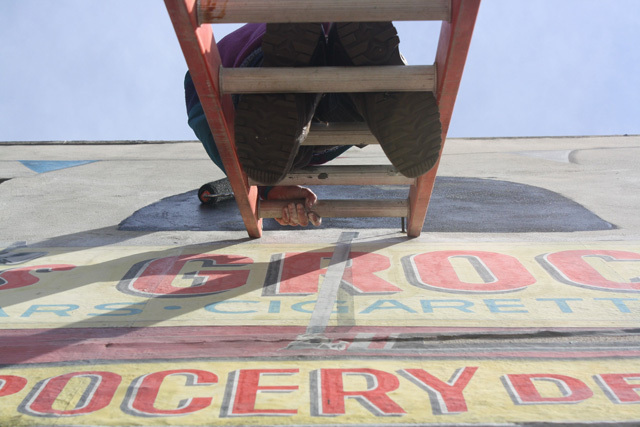 Long time collaborators and friends Chris Stain and Billy Mode bring a personal history to each mural they create. Through the years, this partnership has lead to a fast, seamless work ethic. 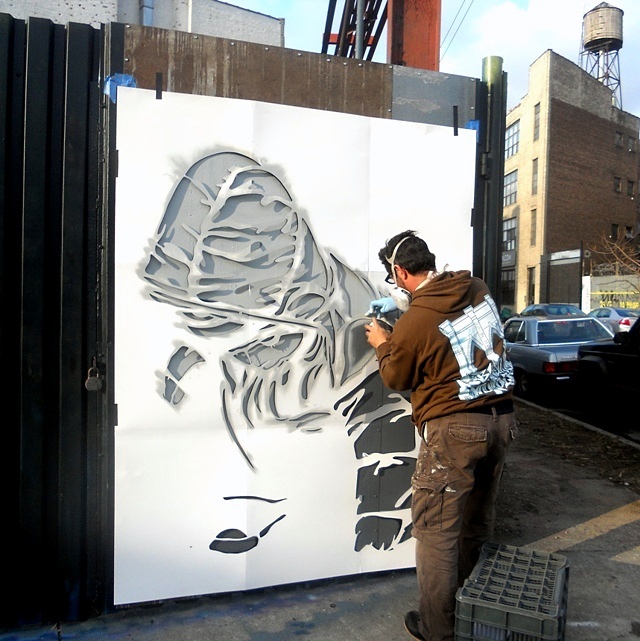 From watching the creation of their wall for Open Walls Baltimore in 24 hours to their latest creation at the Bushwick Collective, which took about a week despite weather conditions, the duo always work in a manner that is astounding in imagery and efficiency. When the two artists find time to break from their schedules of school, family, or skateboarding to take on a new project, it is known that it will be nothing less than awe inspiring. On a series of ladders and forklifts, Chris and Billy become like a structured ballet as they weave around each other, never interrupting the other’s flow except to make the odd joke. While the artists have great personal history, their imagery deals with their hopes for the future. Billy Mode’s text speaks to this message, telling the youth of the neighborhood that the future is theirs to invent. In addition to the this literal embodiment is a figuritive explanation as two children embrace, sharing their love for each other and the future. These girls represent those who will shape the world’s future, the youth of today. 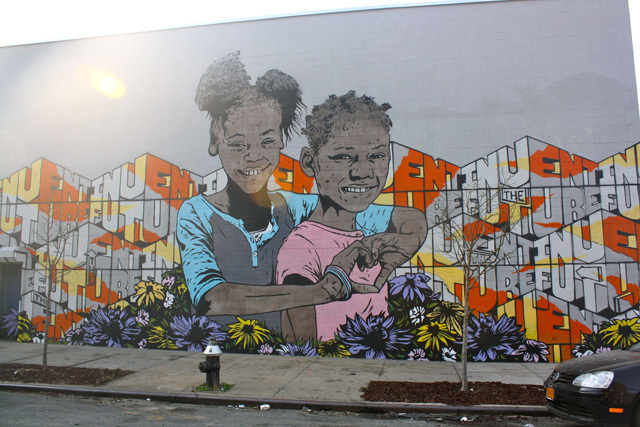 Through a combination of metaphors, Billy Mode and Chris Stain hope to give hope to adolescents, whose creations could one day be seen on the walls of Bushwick. 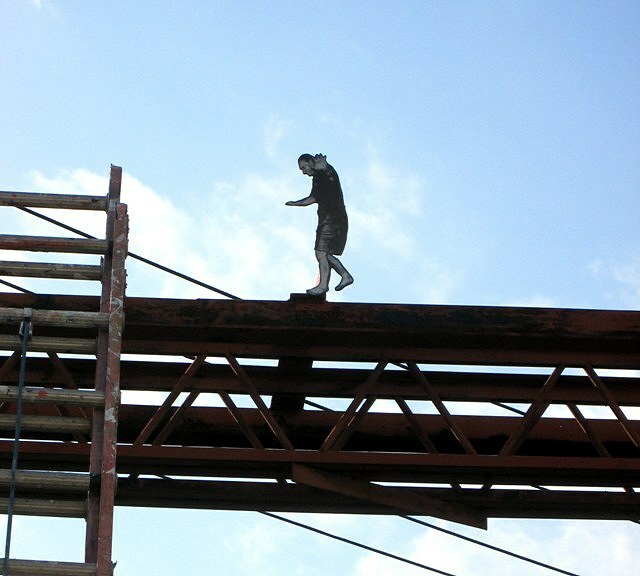 When Joe Ficalora (pictured left) brought me to the roof adjacent to Alicé Pasquini’s wall he said, “only family comes up here.” The deep personal connection I felt looking over a year’s worth of accomplishments with Joe and Alicé is the feeling that both individuals are trying to instill upon the community surrounding this intersection. A close Italian family who emigrated to Brooklyn only generations ago, the Ficaloras welcome any person to the neighborhood who shares their passion for beautification, like Joe’s grandmother who is always quick with coffee and snacks on cold days. Although the nexus of this project was marked with personal tragedy, these losses became the impetus for change. 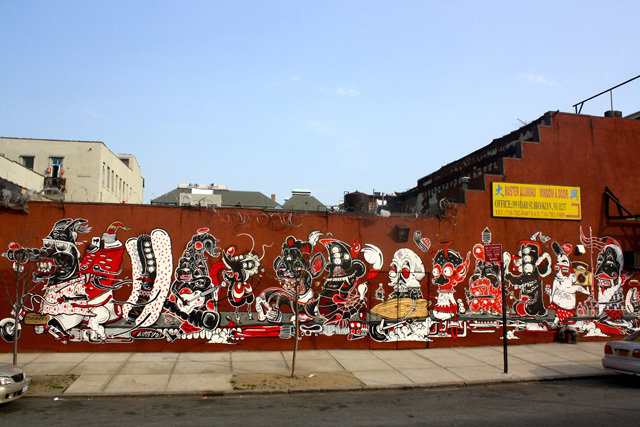 Starting during Bushwick Open Studios last year, the area quickly became the Brooklyn hub for visiting muralists, which gave Yok and Sheryo some of their first walls as well as other notable visiting artists, such as Nychos and most recently Alicé Pasquini. 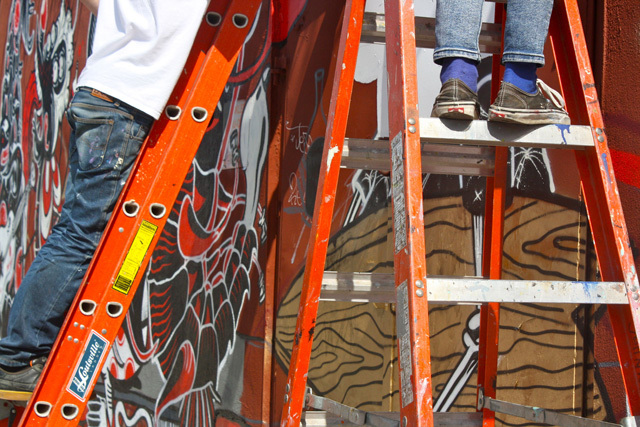 For her first visit and wall in the United States, the artist worked through the wind, which at one point toppled her ladder, to complete a deeply personal mural for the area. The wall that the Italian artist was given previously belonged to Jim Avignon, the yellows of which were incorporated into the space’s latest iteration. The figures in her piece, titled “As Much As You Can,” bustle around the streets of Alicé’s imagined vision of New York City. Having never previously visited the city, the artist imposed the dreams and ideologies of her imagined characters, who represent the beliefs of the many people who come to this city for a new life. Being aware the Ficalora’s roots in her native Italy, the artist painted this piece as a tribute to not only all immigrants, but specifically for his family. 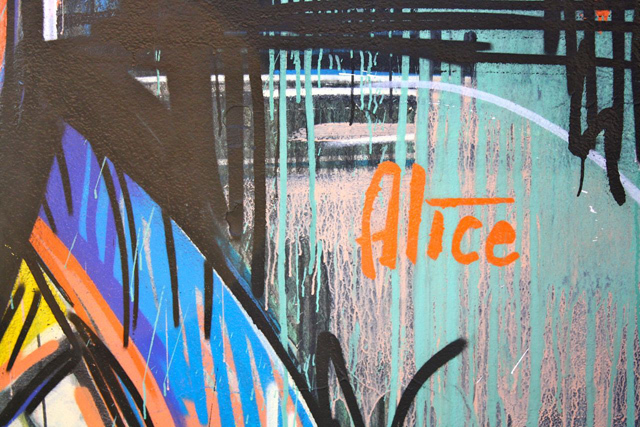 From the sense of family I felt when standing on that roof to the kindness that the Ficaloras extend to any person who finds their way to the neighborhood from the Jefferson train stop, Alicé has distilled this sense of belonging into her mural. By reflecting the vibrancy and closeness that occurs in the small neighborhoods within New York City, one would think she had lived here her whole life, rather than a first visit. 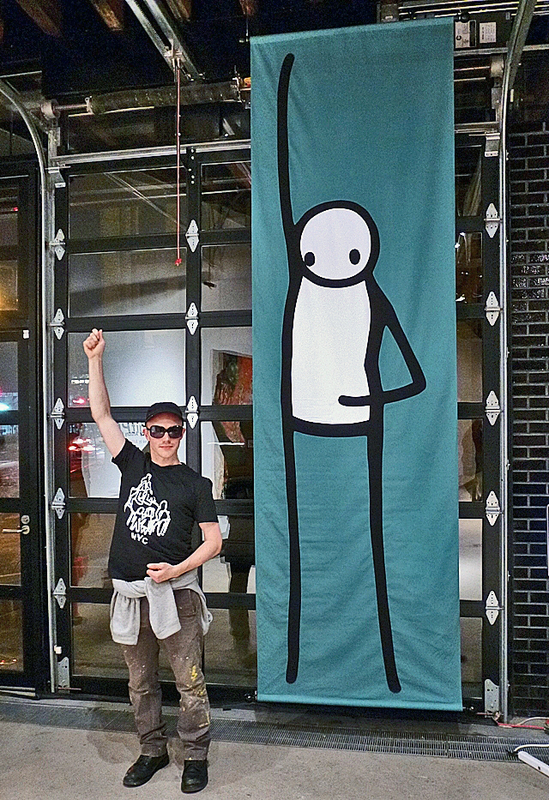 Stik in “AgitPOP” in Chelsea, Manhattan. Photo courtesy of Stik. 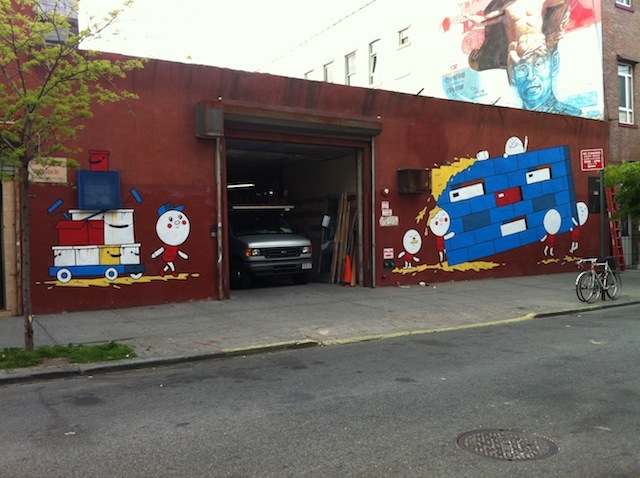 In NYC this past weekend for the opening of AgitPOP, a group exhibit curated by Anthony Haden-Guest, London-based artist Stik also made it to the Winter Mural Project at Bushwck Five Points. 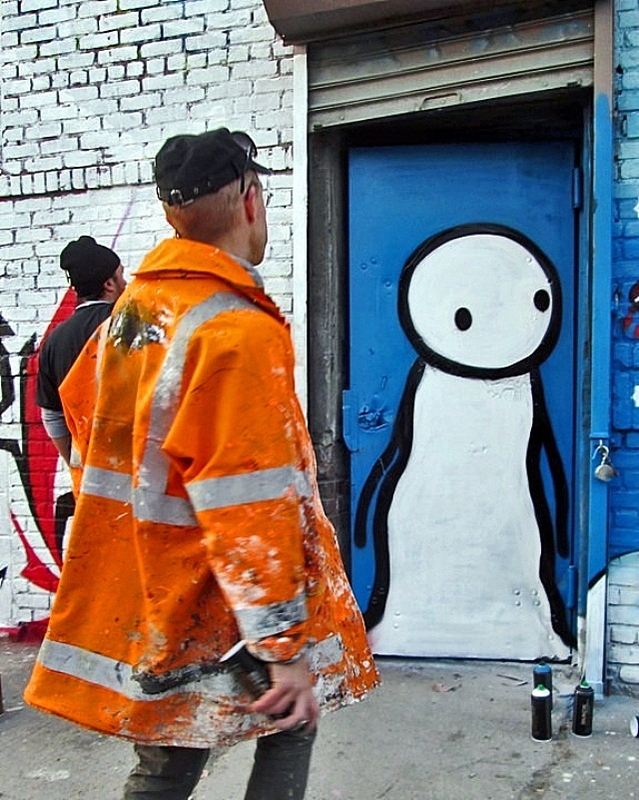 Stik at Bushwick Five Points. Photo by Lenny Collado. 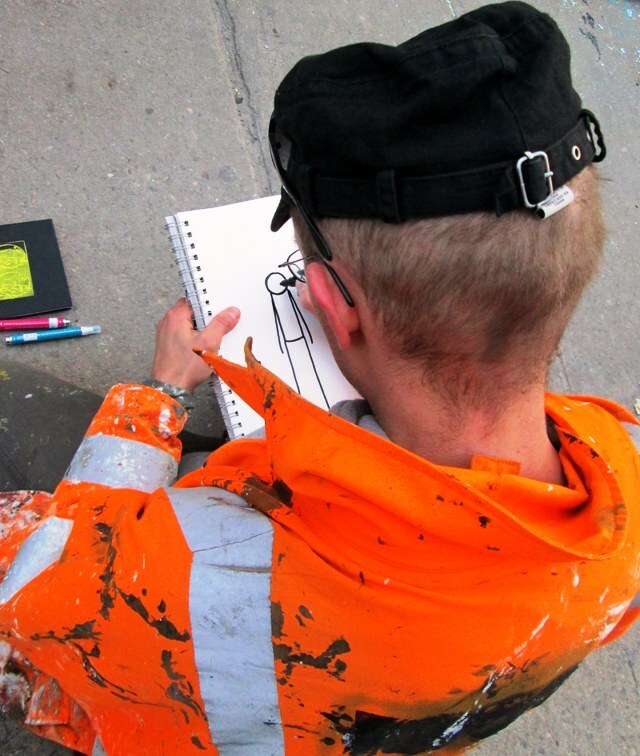 Stik signs fan’s black book. Photo by Lenny Collado.